Are you one of those people who has a collection unused tubes of lipstick? The shade seemed fun and daring in the moment, but later seemed clownish or too dramatic, and you never wore it again. 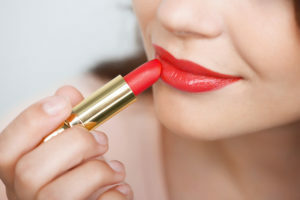 No matter how many choices there are in the cosmetics aisle, all lipsticks come down to five basic shades: true red, orange-red, blueish red, nudes (from beige to brown), and pinks. When you have the right color, wearing lipstick is a quick and easy way to look fresh and feel great. We’re here to help you pick two go-to shades – one for daytime and one dressy—so you feel even more beautiful and confident. Tip 1: Find a color to wear every day. For a color you can wear every day, look at your lips’ own natural color. Then look for a lipstick that that’s one or two shades darker than your own—nudes and pinks are a great place to start. This strategy will give you a color that always look good on you and goes with everything. Tip 2: Explore a statement color. Understanding the cool/warm test helps you narrow down the best colors for you. For example, warm-toned people look radiant in warm-toned lip colors—coral, red-orange, cinnamon. Cool-toned skin looks most attractive with lip color that has blue tint—berry, plum, ruby. If you notice that your wrist veins look neither blue nor green, you’re “neutral”—the lucky type that can wear any color with grace. Tip 3: Reduce the need to touch up. Although there are lots of tools available, applying color directly from the tube gives you longer-lasting coverage. Lipstick with a matte finish needs less touching up than gloss. To set the color, just blot with a tissue or apply a little powder and get on with your day—or night! Try out lots of options in good light. Choose a range of colors you like and apply them to your fingertips—which are closer in color to your natural lip. Once you’ve narrowed down your options, use a clean tester on your own lips and see how it looks to you. Using this process and the suggestions above will give you much better results. Announcing our new makeup line from Osmosis Cosmetics. Stop by Simply Blissed and find your new go-to color from our gorgeous, organic line of beauty products. We have lots of natural light and are happy to help you find perfect shade for a new, confident you! Special Bonus is happening now! If you stop into our spa by next Saturday, June 30, you can try out these lip color tips and receive a gift with purchase. We’re giving away your choice of a free lip pencil, lip gloss, or eye pencil with Osmosis purchases over $50. So come in soon. We can’t wait for you to discover Osmosis + Colour!